was founded on July 27th in 1951, Versailles (France), as International Union of Social Democratic Teachers (IUSDT) -- Union internationale des enseignants socialistes -- Unión Internacional de Profesores Socialistas Demócratas -- Internationale Union Sozialistischer Demokratischer Erzieher (IUSDE) . 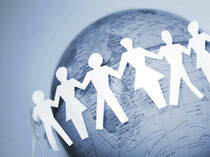 ISDUE has a worldwide network of national organisations. The members are either social-democratic / socialist Parties, affiliated to the Socialist International, or educational organisations associated to the Parties. focus educational discussion and work on the new world dimension, including the situation in Europe and problems of developing countries.